KORRES is a fantastic Greek skincare brand that I absolutely love. It’s conscious of its ingredients – using natural and organic where ever possible and avoiding anything potentially harmful across its product range. And now, just in time for Christmas, it has launched a series of gift sets containing its worldwide best sellers, making them a sure hit if you’re looking for stocking fillers or beauty gifts for yourself or your loved ones. My favourite one in the range is Sleeping Beauty, a great pack ideal for travelling or sleepovers. 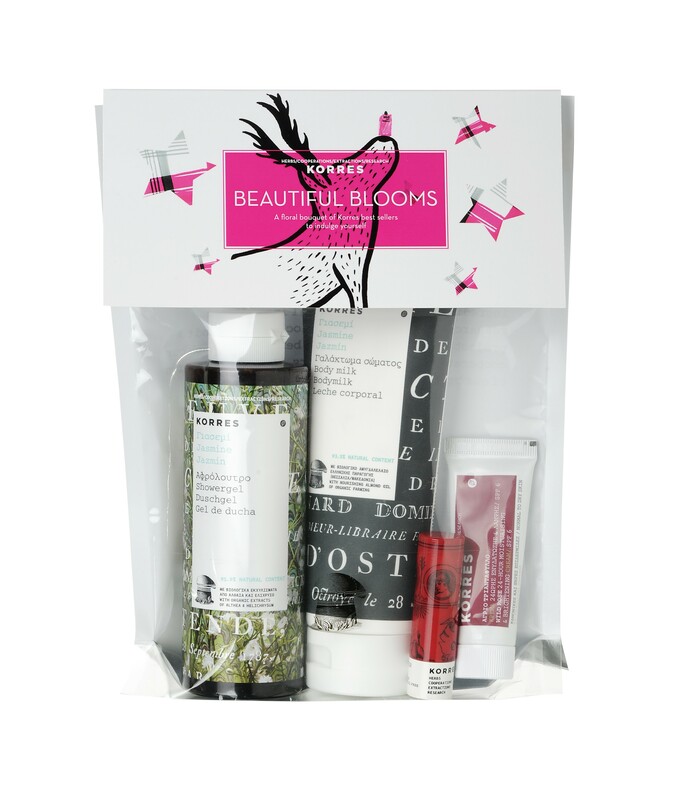 The set contains some great essentials: a shower gel, a facial cleanser, a lipstick butter, and a 24 hour moisturising cream that contains wild rose. One of my favourite skin ingredients is rose, and so is my husband’s, so this is one I’ll have to share with him…The Wild Rose 24-hour cream SPF6 normal-dry 16ml is very hydrating as it contains Wild Rose oil, a natural source of Vitamin C and what I love about it the most is the smell and the fact that it has an SPF in it, perfect to use to combat the winter sun. The Basil Lemon shower gel 40ml is another classic product that you’ll enjoy for its creamy, hydrating texture and divine smell – especially in the morning as the lemon zest gives you a kick. The White Tea fluid gel cleanser 16ml is a gel that foams slightly giving you that sensation of really cleansing your skin. It contains vegetable derived soap substitutes with oat proteins in its formula for maximum moisturising. The final product in this collection is the Korres Wild Rose mandarin lip butter stick 5ml in Rose, a great butter stick that is ideal to use on your lips during the harsh, cold winter months. This particular product has a hint of pink, giving you a barely-there make up look that is so on-trend right now, and simply exudes a healthy groomed look. It also has an SPF 15 to ensure your lips are totally kissable. This entry was posted in Ethical, Gift Set, Skincare, trend, Wellbeing and tagged Basil Lemon shower gel 40ml, Gift set, Korres, Korres Wild Rose mandarin lip butter stick 5ml, lip balm, luxury, moisturiser, Natural, nourishing, organic, rose, Sleeping Beauty, White Tea fluid gel cleanser 16ml, Wild Rose 24-hour cream SPF6 normal-dry 16ml. Bookmark the permalink.